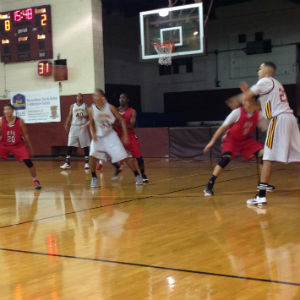 A 19-4 run to close out the first half gave Fishburne separation, and the Caissons coasted from there in posting a 125-87 victory over Rio Grande in the postgraduate team’s season opener Friday night in Waynesboro, Va.
After bolting to a 30-15 lead midway through the first half, Rio Grande closed to within nine at 47-38 with three minutes left in the first half. An and-one by Stanley Christian (6’7”, 200, Norfolk, Va.) pushed the lead back to double digits, and a three from the right corner by John Whitaker (6’6”, 175, Oakton, Va.) made it 53-38. Another Whitaker three and a conventional three-point play by University of Washington commit Devenir Duruisseau (6’9”, 240, Palmdale, Calif.) highlighted the run. “We played well in transition. We were able to go pretty deep with a lot of our guys getting a lot of minutes. Defensively, we’ve got to do a much better job,” said first-year assistant coach Donte Hill, a 2013 graduate of Old Dominion University who started his college career at Clemson. It’s been a big week for the Caissons with several players making their college decisions. Duruisseau committed to Washington and coach Lorenzo Romar in the Pac-12. The Huskies were 17-15 in 2013-2014, but Romar had them in the NIT semifinals in 2011-2012 and the second round of the NCAA Tournament a year earlier. Coming down from that big personal news, Duruisseau, a tough back-to-the-basket offensive force, said it was good to get the first game of the PG season under his belt. “We did well as a team. We just have some things to work on, and I have some things personally to work on, to get better. This is our first game, and everybody is still trying to figure out how we will work together as a unit. We’re getting there. We need to make some adjustments defensively, but we’re getting there,” Duruisseau said. Jeremy Harris (6’7”, 185, Greensboro, N.C.) also made his college choice this week, committing to Coastal Carolina, an NCAA Tournament participant in 2014 that gave the East Regional #1 seed UVA all it could handle before going out in the second round. “I loved the campus and the coaching staff when I took my visit. I think I have the chance when I go in as a freshman to get some minutes,” said Harris, a rangy perimeter player with a nice three-point jumper, the ability to get to the rim and solid defensive skills. Ahmad Frost (6’1”, 180, Cincinnati, Ohio) announced this week that he is headed to Maryland-Eastern Shore. Friday night, the focus was getting up to speed on the court with his new FMS teammates. “We came out with a lot of energy. We played fast and got some stops on the defensive end. We were able to get into a flow,” said Frost, who is looking forward to developing his point-guard play this year under Fishburne coach Ed Huckaby, a former college assistant and D1 college point guard as a player. “I’ve learned a lot from Coach Huck. He’s taught me to be a real vocal leader and more of a true point guard,” Frost said.